Marija Posavec, former administrator in Croatian National Tourist Board lived a normal life until five years ago. Then suddenly sciatica attacks begun. First, every 6 months, then regularly every month… She did not realized how serious problem that can be, and she ignored it, took pills, injections and other medications. She started to visit doctors: physiatrists, orthopedists, chiropractics… Nobody realized how serious her problem was. She was regularly sent for two weeks physical therapy sessions in local rehabilitation center. But no, that was not helpful, it only did harm to her. From every visit to rehabilitation center she would return home in even worse condition. After realizing that situation is getting serious, she decided to go for neurosurgical opinion for her problem. Doctor suggested surgery immediately: traditional big-incision discectomy (interlaminectomy), the diagnosis was disc extrusion at L3-L4 level. She had surgery in November 2007, returned home with new, worse and very strange symptoms: very strange low-back pain, new leg pain, raised body temperature and overall very bad condition. She went for follow-up meeting with her neurosurgeon who looked over at new MRI and just told “All is fine, you have to be patient, there is no re-herniation, you will get better”. Unfortunately, she was not getting better. She went for 15 more follow-ups (yes, you’ve read well, 15 follow-ups!) from November 2007 to February 2009, and her neurosurgeon had no reply or comment on her terrible pains. In March 2009 she made her life’s most crucial decision, she decided to go on. To find a new hospital, new spinal surgeon and new life. Luckily, she found about Dr. Robert Saftic, with who she agreed first examination on 15th March 2009. First impression was – IMPRESSIVE. 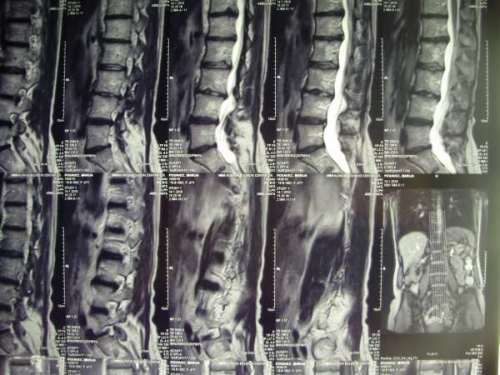 When he saw her images he almost started to laugh, because how is possible that nobody saw high degree of L3-L4 disc degeneration (degenerative disc disease). Ms. Posavec did not have classic disc herniation that causes pains, she had internal disc disruption in which disc itself causes pain from inside. Dr. Robert Saftic is young neurosurgeon educated in world’s best spinal centers by world leaders in spinal surgey. He is educated to perform state of the art minimally-invasive procedures that offer high patient satisfaction at minimal risks. And this exactly is the way Ms. Posavec wanted to go. So, she had a fresh new start. Most important was a proper diagnosis. That is why new MRI (magnetic resonance imaging) was ordered and followed by provocative differential discography. MRI showed several diseased discs (degenerative disease in L3-4 that was already operated, and high-intensity zones in L1-2 and L4-5), and discography confirmed disc degeneration and abnormal pattern at L3-4 and L4-L5. Now, the most important thing was to differentiate the pain sources. Doctor Robert Saftic first tried to repair already damaged and operated disc with minimally-invasive percutaneous endoscopic intradiscal surgery, but that eliminated only 15% of Ms. Posavec’s pains. After that, L4-L5 disc was eliminated as pain source by injecting intradiscal therapy in it, and by performing PLDD (percutanous laser disc decompression) to seal the annular tear. And later, disc L1-L2 was eliminated as pain source, also by performing PLDD (percutanous laser disc decompression) to seal the annular tear. 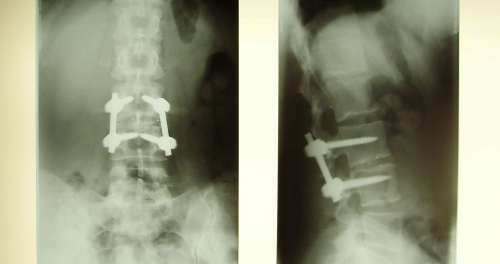 So, it was total of 4 spine surgeries – 1st traditional by first surgeon, 2nd, 3rd and 4th all minimally-invasive made by doctor Robert Saftic. It was more and more obvious that source of her pains and problems is damaged L3-L4 disc. As always, invasive methods like ADR (artificial disc replacement) and spinal fusion are always last resort. Doctor Robert Saftic decided to go for less-invasive version of TLIF (transforaminal lumbar interbody fusion). In the sunny morning on 8th Match 2010, Ms. Posavec was scheduled for the TLIF surgery. It was very hard case and very demanding surgery, it took almost 4 hours. She was in terrible condition and pains after the surgery (during the first few hours). The day after day she was feeling better and better. Strange feeling of “knife in her back” was miles away from her. Now, 3 months after the surgery Ms. Posavec is in spine rehabilitation center in Croatia, feeling very good and able to do her daily activities under minimal medications.